Copyright remains with the original holder, no reproduction without permission. 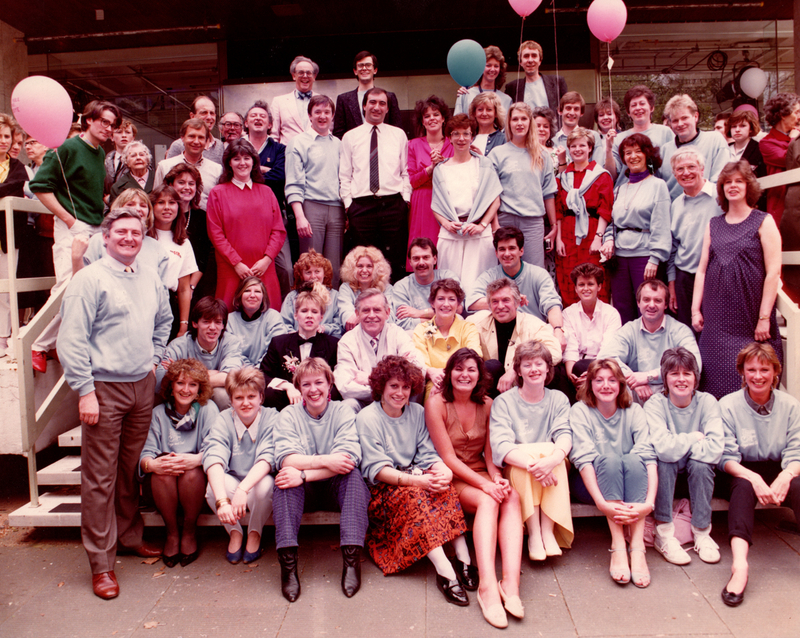 This photo was taken just after the last ever ‘Pebble Mill at One’ on 23 May 1986. In fact you can just see the last few members of the audience leaving on the left hand side of the photo. Back row: Michael Smith (celebrity chef), David Lancaster (glasses), Caroline Marshall, Steve Weddle. 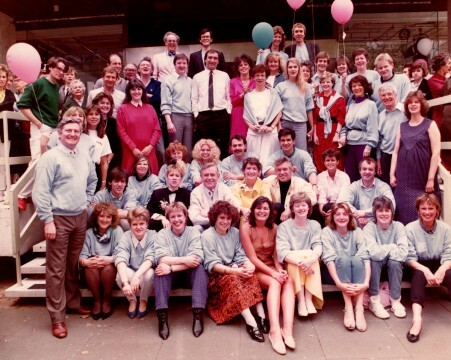 Next to back: Julian Hitchcock (with pink balloon), Chris Wright, Roger Sutton (just behind the others), possibly Barrie Edgar peeking out behind, Tony Rayner, Peter Urie, Peter Hercombe, Claire Chambers, Norma Scott, Mary Clyne, Mark Kershaw, Trudy Stanton, Steph Silk, Richard ?. Please add a comment if you can fill in any of the people not identified. Thanks to Mark Kershaw for making the photograph available. Looks like Trudy Stanton in between Mark Kershaw and Steph Silk. And Roger Sutton on the left-hand end of the second-to-back row. Thanks Jonathan, I’ll add them in.